We fail to understand the marketing strategy Ford has been following for the EcoSport. Spyshots of test mules from being a monthly affair have gone on to become a daily affair and from being a daily affair, are becoming more than once a day affair. And we are not kidding. We have a spyshot of the EcoSport in a different colour every now and then for multiple times during a day. Ford might just be taking too long to launch this product officially. 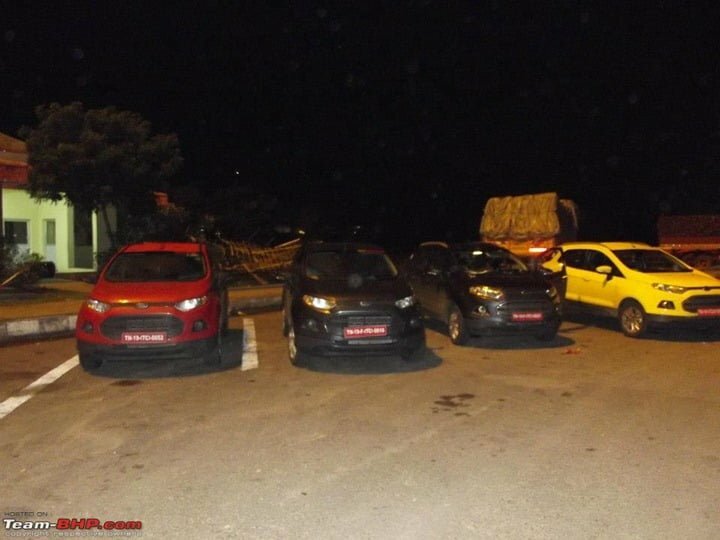 Today we have for you the spyshots of not one,not two, not even three but four Ford EcoSport getting tested together. It’s more like taking a nap together. 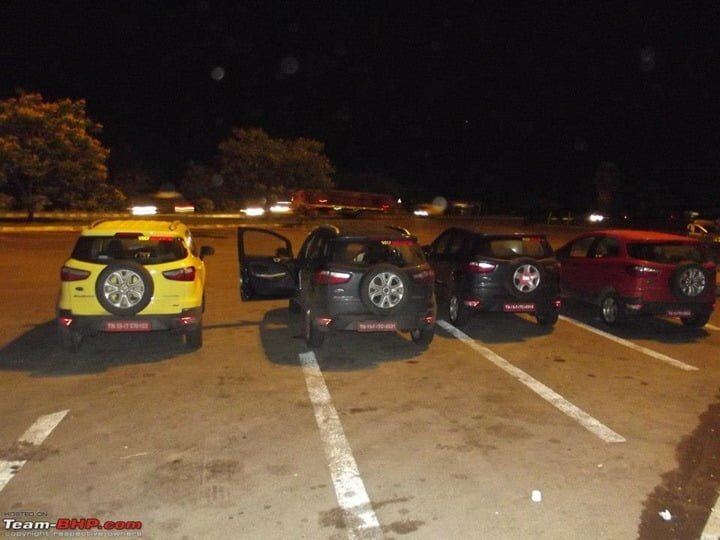 We have some spyshots today which reveal a complete convoy of the EcoSport taking a break in a parking lot. The colours were ‘Savannah Orange’, ‘Bright Yellow’ and ‘Sea Grey’. We also have displayed the spyshots of the car in Red and Blue colour which we believe pretty much complete the colour options as far as they are concerned. The test mules spotted were in Titanium variants which are pretty much the top-of-the line variants and had audio mounted music controls and a push-button ignition system as standard on them. 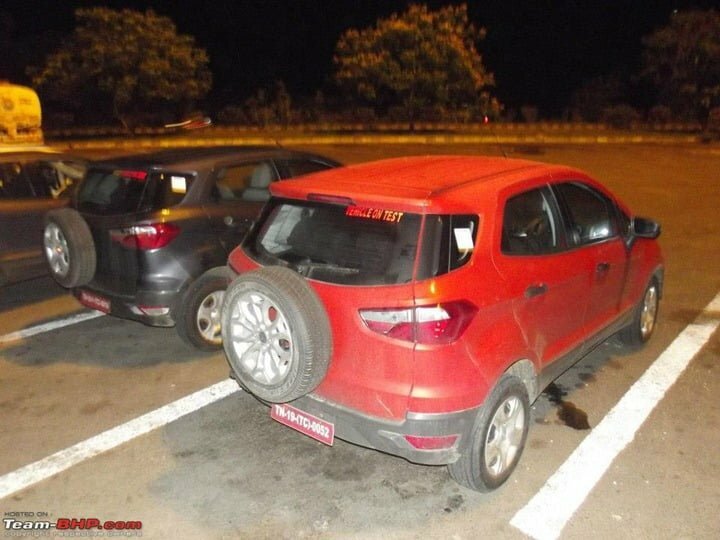 With the looker that the EcoSport is, it manages to turn eyeballs wherever it goes and people don’t think twice before clicking a spyshot of the car and posting it on the interweb. The EcoSport will be launched in bright colours for the mere reason that India has a lot of sunlight to make these colours look prettier. Ford has been keeping quiet about the launch of the cars but some dealers have reported that the car’s bookings shall begin by April-May 2013 with the car hitting the roads by August 2013 in India. Ford seems to be creating a lot of hype about the car before its launch but if it delays it too much, all this hype will die down soon and the spyshots will become more of the shots of a regular car on the roads. Ford, Are you listening? Launch it soon before we change our mind to buy this small wonder.